A sculpture of a crucified Ronald McDonald on display in Haifa. 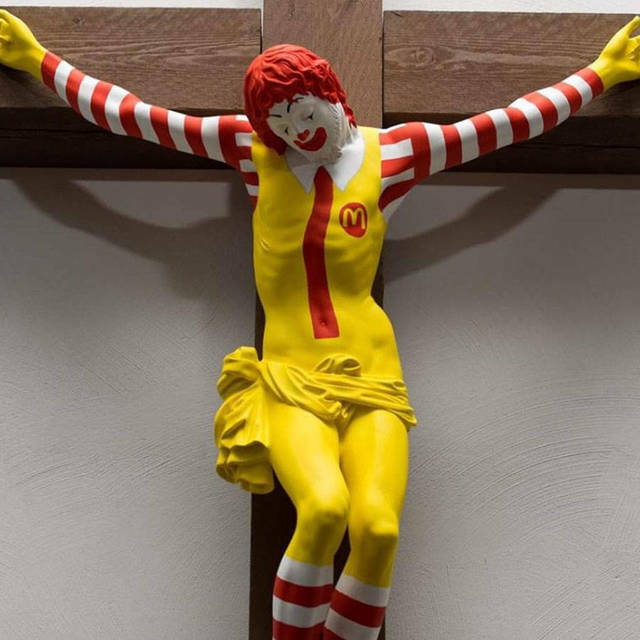 A sculpture of a crucified Ronald McDonald on display in Haifa has deeply offended the Christian population leading to violent protests. In the meantime, Israel claimed responsibility for a strike on Iranian targets at the Damascus airport and declared a successful conclusion to Operation Northern Shield after finding a sixth Hezbollah tunnel. Hundreds of Christians massed in front of an art museum in Haifa on Friday to call for the removal of an offensive work: a sculpture of Ronald McDonald hanging on a cross. 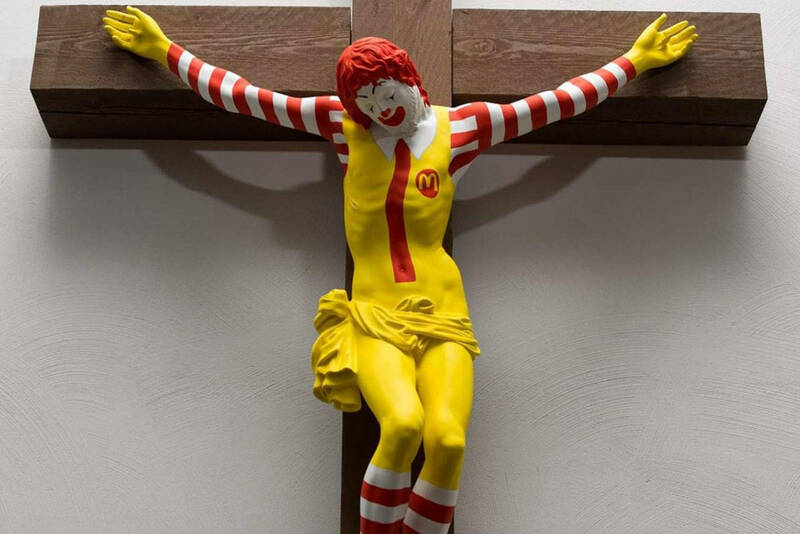 Dubbed McJesus, the crucified fast-food icon has been on display since August quickly receiving complaints, but tensions sizzled for too long leading to massive planned protests against the art. On Friday, hundreds of mostly Arab-Christians gathered to protest in front of the museum, but a scuffle with police boiled to a full brawl when protestors tried to enter the museum. Three police officers were wounded by thrown rocks, and protestors were dispersed with tear gas and stun grenades, according to the Times of Israel. The day before the protest, a firebomb was tossed at the museum. These violent outbursts are not coming out of the blue. For months, church authorities have petitioned for the art to be removed but the response has been slow. “We denounce the exhibition and the injury to the holiest symbol of Christianity by an institution that is supposed to serve citizens of all religions,” the Rev. Archimandrite Agapious Abu Sa’ada of the Greek Melkite Catholic Archeparchy of Acre told Ha'aretz. A protester told the Walla news site he believes the response has been sluggish because it concerns a Christian minority. In a full statement, the church said it respects free speech and recognized the intent of the exhibit, but not to the extent of the defacement of the holiest symbol in Christianity - the image of the crucifixion. Despite these strong objections from the church, they have also called for a cessation of violence to give the authorities more time to resolve the situation. The negotiations were not short and, whether or not they’ve been expedited by the brawl, they are finally beginning to yield results. Israeli Culture Minister Miri Regev sent Haifa Museum director Nissim Tal a letter officially calling for the sculpture’s removal. 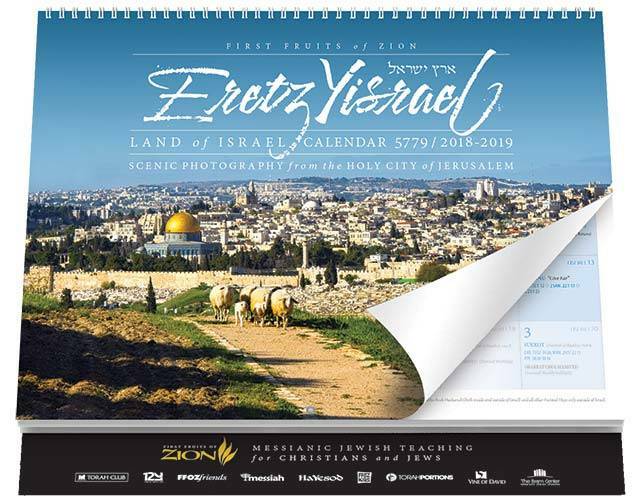 In response to Regev’s letter, however, the Association for Civil Rights in Israel sent a letter to Deputy Attorney General Dina Zilber asking the office to clarify to the culture minister that she has no authority to interfere in the museum’s artistic content. The museum displaying the art has agreed to at least use a screen to shield the general public from the crucified Ronald and to put up a sign outside the exhibit warning that some material may be found offensive. In a statement, the museum also called for objections to be filed peacefully. When the first reports of an airstrike near Syria’s Damascus airport first came in on Friday night, it was no surprise to see fingers start pointing to Israel, but what was more surprising was how quick Israel was to claim responsibility for the strike. The target was an Iranian weapons stockpile housed in a warehouse at the airport. Israel has openly admitted to a campaign to hold Iranian forces fighting in Syria away from the Israeli border, but it is rare for Israel to so quickly admit they conducted the strike, which reportedly did not disturb air traffic. This time, not only did Israel own up to the strike, but Prime Minister Benjamin Netanyahu warned that strikes like this could intensify, according to the Jerusalem Post. Netanyahu’s threat should not be taken lightly. So far, through extensive airstrikes targeting Iranian military infrastructure, Israel has handily demonstrated that it will not tolerate an encroaching Iranian presence in Syria. In 2018 alone, Israel dropped 2,000 bombs, according to a recent New York Times interview in an opinion column with Lt. Gen. Gadi Eisenkot, Israel’s outgoing chief of staff. So far, Israel has been able to strike in Syria with near impunity, perhaps partly because of the habitual reluctance to either confirm or deny responsibility in the strikes. Syria, on the other hand, has had no hesitation in condemning Israel over the strikes. On Saturday, Syria said it filed complaints with the UN Security Council and with the UN Secretary over the airport strike, though UN displays against Israel are nothing new. Despite the UN filing, it is worth noting that Syria has been slower to openly attribute airstrikes to Israel ever since a Russian military plane was downed by Syrian air defenses during an Israeli attack on Latakia, killing all fifteen servicemen aboard. Ha’aretz reported that the airstrike triggered anti-aircraft defenses and claims a number of the missiles were shot down leaving no casualties, according to Syrian state media. After discovering the sixth and largest tunnel so far stretching from Lebanon into Israel, the IDF has officially concluded Operation Northern Shield. The conclusion of the operation, which first began in December last year, marks an end to a sophisticated and lethal threat from Iranian proxy Hezbollah in Lebanon - the danger proven by the discovery of the last tunnel. Hundreds of feet long and 180 feet deep, the tunnel contained “railroads to transport equipment, garbage, lighting equipment and ladders to enter Israeli territory” according to IDF spokesman Brig. Gen. Ronen Manelis. Israel has widely publicized the presence of the tunnels from Lebanon by inviting news crews to witness and investigate the operation, filing treaty violation complaints with the U.N. and detonating the tunnels or filling them with cement that has apparently been seen pouring out of the tunnel entrance on the Lebanese side. This week on the Gaza-Israel border the IDF reported that 13,000 Gazans amassed on Israel’s border, throwing grenades and explosives in the ongoing, weekly March of Return protests that have left scores of civilians and Hamas members dead. This weekend’s protests left one Palestinian woman dead and one IDF soldier wounded by a stone. The IDF said there were three incidents of Gazans breaking through the border fence into Israel. In response, Israel targeted two Hamas outposts. A rocket launch from Gaza was also reported, which triggered strikes on Hamas targets by Israeli jets and helicopters. Also on Friday, a Palestinian man attempted to stab Israeli soldiers in Kiryat Arba, but was shot and killed by the soldiers before he could reach them. More than 205 Palestinians, some Hamas members, have been killed and more than 22,000 injured since the protests against the Israeli blockade of the Gaza Strip began on March 30, according to the Hamas-run Palestinian Health Ministry.